We had some friends visit while they were on vacation in northern Arizona over the Thanksgiving holiday this year. One night after dinner the topic of conversation drifted to my work with the USGS Astrogeology Science Center here in Flagstaff as an IT Specialist. They had seen Internet articles about the Flagstaff Lunar Legacy Celebration of the 50th anniversary of the first human to set foot on the Moon. 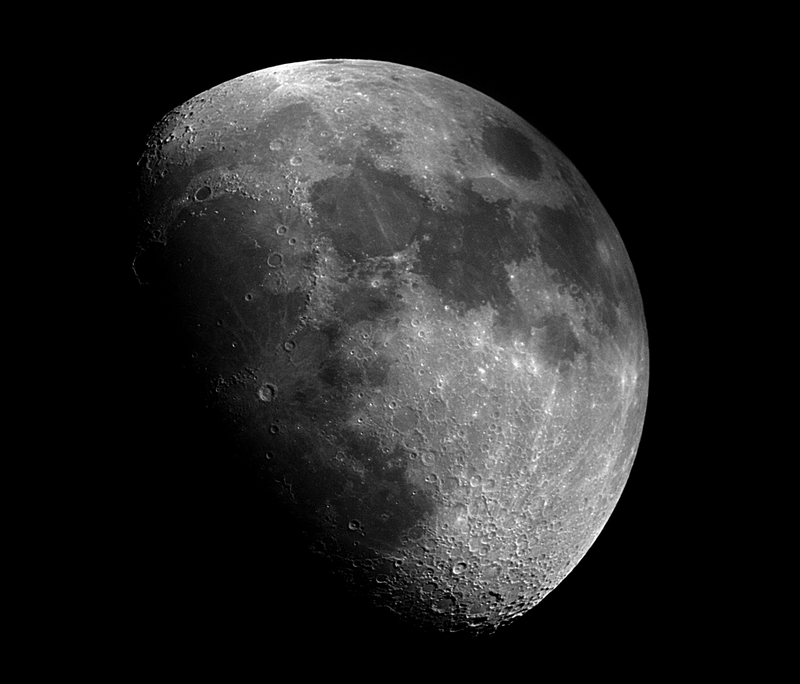 My friends knew I was an amateur astronomer and as our discussion about the Moon continued, they asked me if I had any photographs of the Moon taken through my telescope. Over the past several months the Flagstaff Lunar Legacy Celebration has garnered more and more attention around town and at work and had me turning my telescope to view the Moon more often too. I had to admit that I'd only taken a few quick snapshots and hadn't really spent too much time creating a nice quality photo. So, I invited our guests to my home office, where we set to work fixing that. Over the years I have built a robotic, remotely controlled telescope in a protective dome that I can operate entirely from the comfort of my home office. I have created images of the night sky and sent many of them to our friends in the form of Christmas cards, in special occasion newsletters, and just for fun when a new one was completed. I knew the Moon was up and thought we might be able to get a nice photograph. 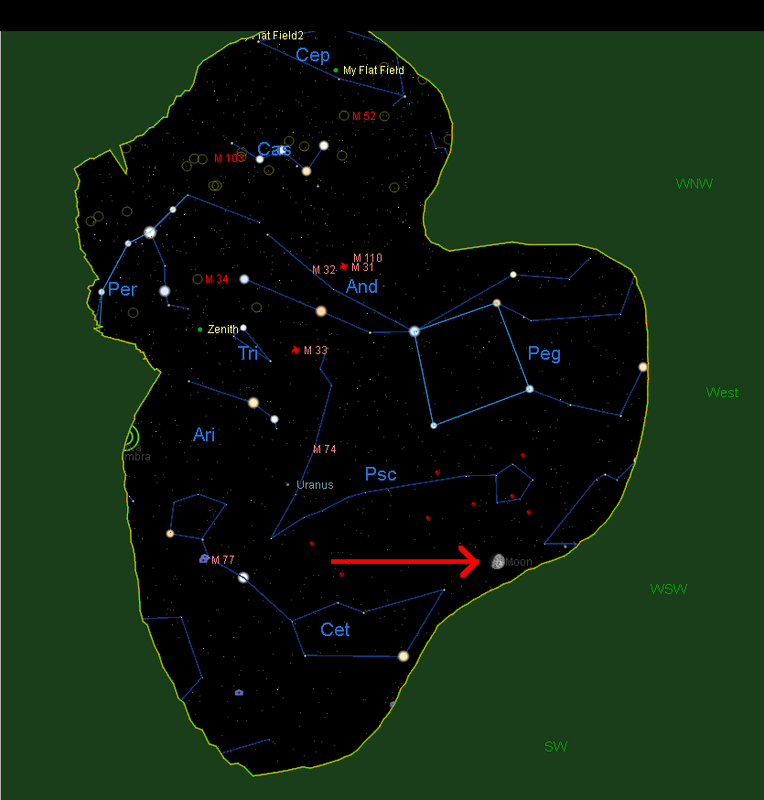 It was Saturday night, November 17, 2018, around eleven-thirty and the following illustration shows the piece of the sky clearly visible at that time. You can see the Moon at the lower right just before it slid down behind the pine trees in the western sky (outside of the yellow border it's all pine trees). Here is the telescope used to capture pictures of the Moon. 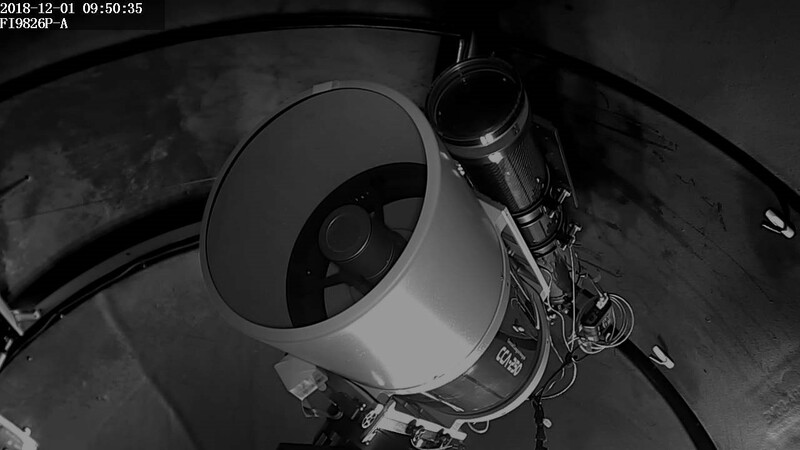 A camera connected to the smaller 127mm refractor mounted on top of the larger reflector telescope was used. After centering the Moon in the telescope's field of view, the monochrome camera was used to collect 100 images while the telescope drive system tracked the Moon to the west. Since the Moon is very bright the camera could be set up for short exposures which helps to defeat the jitter and jumpiness seen with longer exposures caused by atmospheric air turbulence. Each of the 100 exposures here was just over 1/10th of a second in duration resulting in an 11 second stream of images. Of the 100 individual images, I selected the best 30 and used them to create the final image. This involved aligning to correct for slight differences in Moon's position from image to image, processing to reduce artifacts, and combining the images, which reduced image noise and brought out detail. Once we were happy with the resulting image my friends asked: "Where did the Apollo missions land?" So, using photo editing software I added some layers to the image showing the Apollo landing sites. We talked about how the USGS Astrogeology Science Center helped train astronauts, test equipment that might be used on missions to the Moon, make maps to select the Apollo landing sites, and more. I hope that one day I can add new layers showing where new missions to the Moon have landed. And when humans do return to the moon in future missions, I have little doubt that the USGS Astrogeology Science Center here in Flagstaff will once again play an important role in ensuring that the missions are successful. Hmmm, I wonder if I should get a bigger telescope?